Theme Park Review's Midwest USA 2007 Tour! 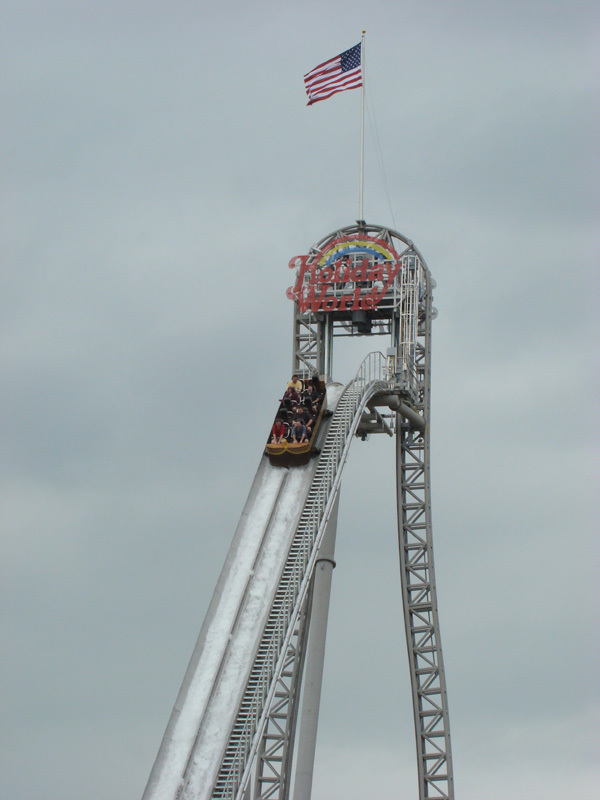 TPR's 2006 Holiday World & Voyage Photo Update! For years Holiday World's main attractions were its wooden coasters: Raven, Legend, and Voyage. You might want to start with Voyage first, because Raven and Legend tend to draw crowds early because they're located near the front of the park (their lines thin out by mid-afternoon). 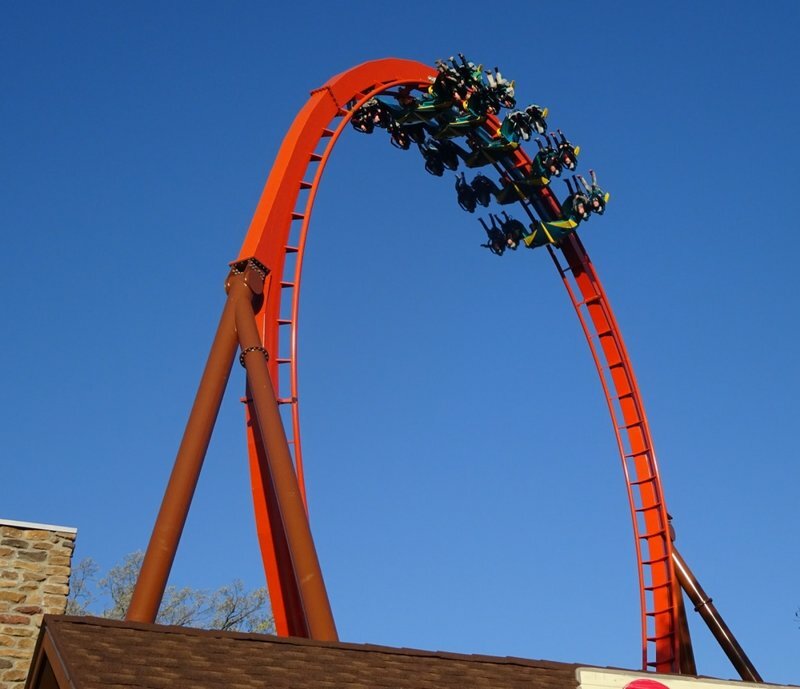 However, the game changed when the park added the first launched B&M Wing Coaster, Thunderbird. 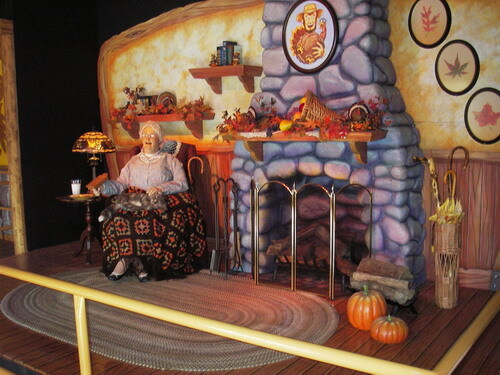 Gobbler Getaway, the park's "turkey-calling" dark ride, is right across from Voyage and worth checking out. Holiday's World's flat ride package is small and basic. HW's extensive water park, Splashin' Safari, draws big crowds on hot summer days and has two of the best water slides anywhere--the LIM-launched Wildebeest and Mammoth. The water park opens at 10:30 am, so its best to get there early, get a locker, suit up, then head directly to Wildebeest, which will draw a huge line (from one to two hours) quickly. HW offers a log ride and rapids ride, too, but the flats are nothing special. Be advised that the park's terrain is a bit hilly, and its layout a little tricky for first-timers. 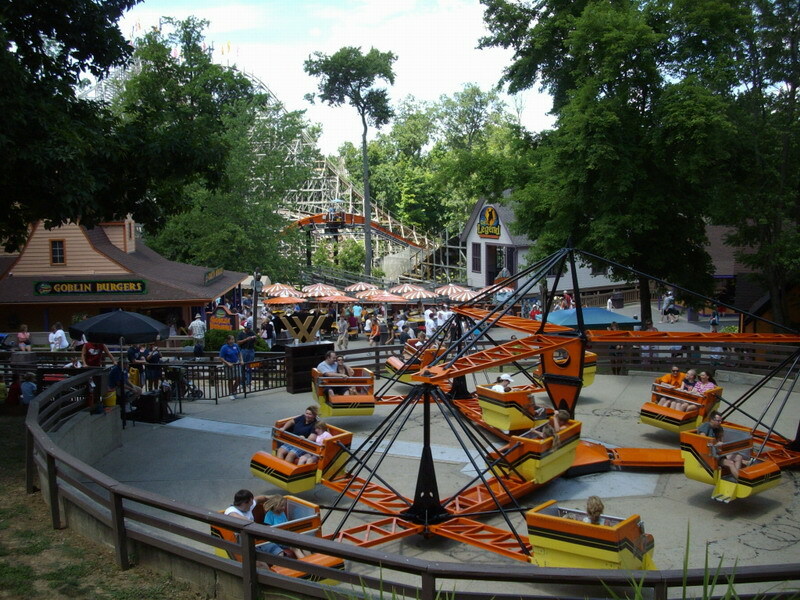 Holiday World offers the usual theme-park fare, such as pizza, hot dogs, hamburgers, and funnel cake, at pretty reasonable prices at stands throughout the park. Pepsi products are also available "free" at various serve-yourself drink stations. For a full meal, your best bet is probably the Plymouth Rock Cafe by Voyage, which offers fried chicken, chicken and dumplings, roast turkey, and ham (with an assortment of side dishes). Holiday World is open from the first weekend in May through October. Splashin' Safari usually opens in mid-May and closes in mid-September. HW usually opens at 9:30 am, while SS opens at 10:30 am. Be sure to check the park's Web site for operating hours--and to make sure the park isn't closed to the public for a "special event." 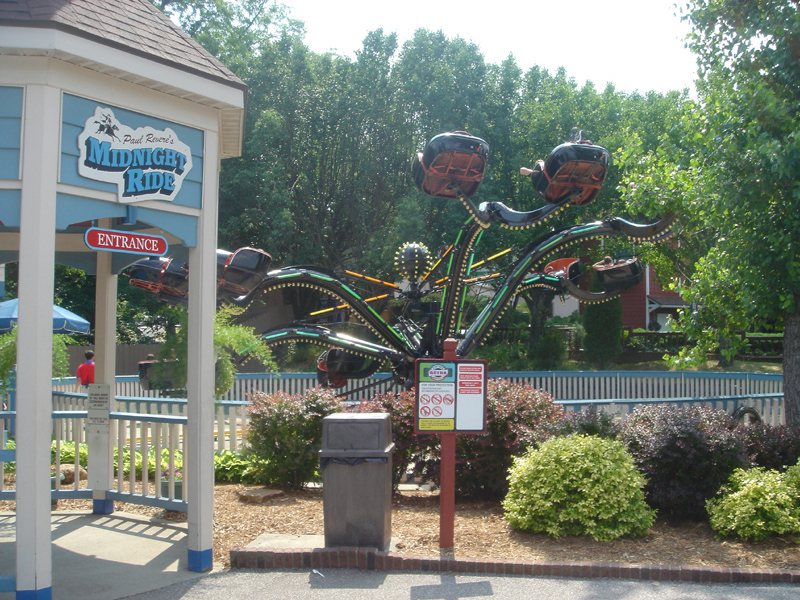 The big enthusiast event at Holiday World is Holiwood Nights, which features ERT on the park's coasters after dark, as well as food and other surprises. 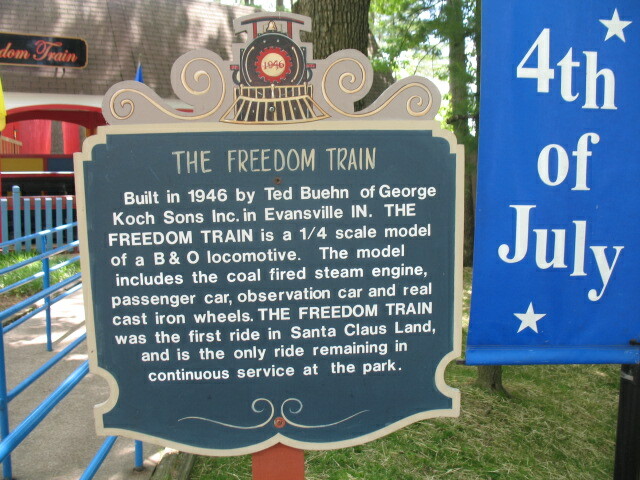 Members of recognized coaster clubs are elgible to participate. Happy Halloween weekends is a family friendly Halloween event during weekends in October. Holiday World and Splashin' Safari are located at 425 E. Christmas Blvd., Santa Claus, IN (at the junction of Highways 162 and 245). The nearest major airport is Cincinnati, but the park offers driving directions from surrounding midwestern cities on its Web site. Santa Claus isn't exactly a sprawling city, but there are a few places to stay near the park: Santa's Lodge, Santa's Cottages, and the Lake Rudolph Campground and RV Resort. Other than that, you can find the usual assortment of chain hotels, such as Motel 6, Hampton Inn, and Holiday Inn Express, in Jaspar, Dale, Ferdinand, and other towns. 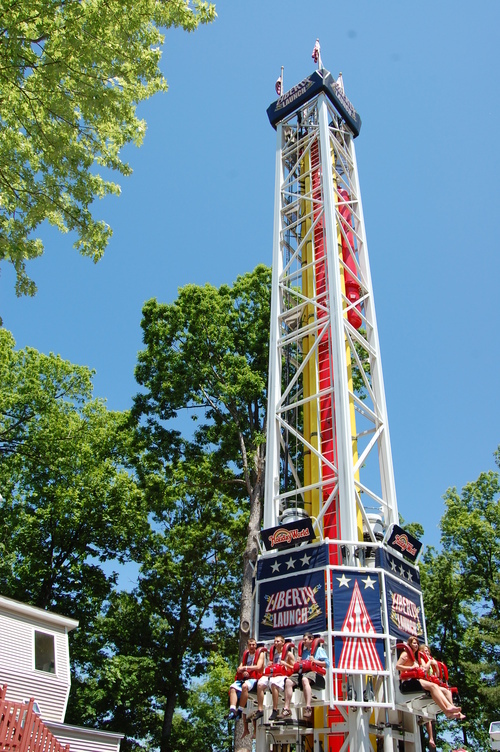 Holiday World offers a variety of family-friendly shows. The most unusual offering is "Santa's Storytime Theater," where kids are invited to join St. Nick on stage for stories, songs, and photos. Other shows feature diving and beach music in the water park, along with country. oldies rock, and Christian. The Holidazzles are a group of street performers. 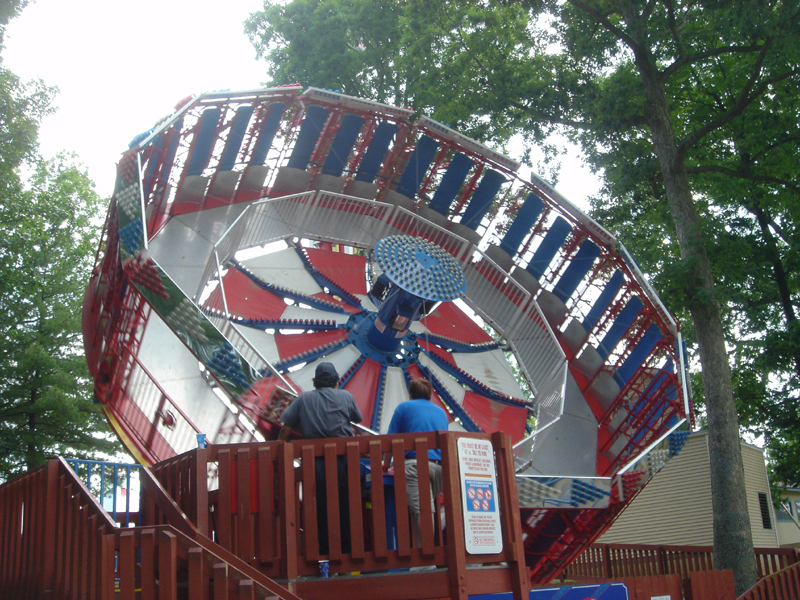 Holiday World lays claim as the worlds first theme park with rides and attractions in four Holiday themed areas. The park is clean, and the staff is friendly. Management sure knows how to please fans of wood coasters with three thrilling crowd favorites, and Thunderbird fills the big void of not having a major steel coaster. 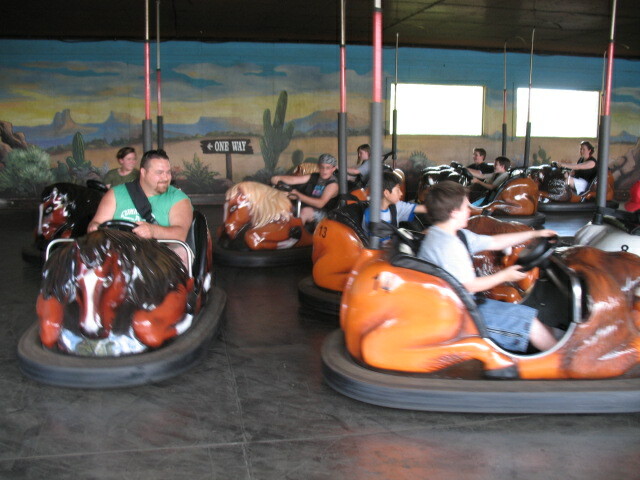 The flat rides are mainly traditional rides and being much more moderate in nature, compared to the coasters, can be a shared family experience. Holiday World has made strides of late in boosting their flat collection, which is considered deficient. One drawback is that while the atmosphere is very family friendly, and quite a few flat rides can be shared as a family, children under 48" cannot ride any of the wooden coasters or many signature attractions. 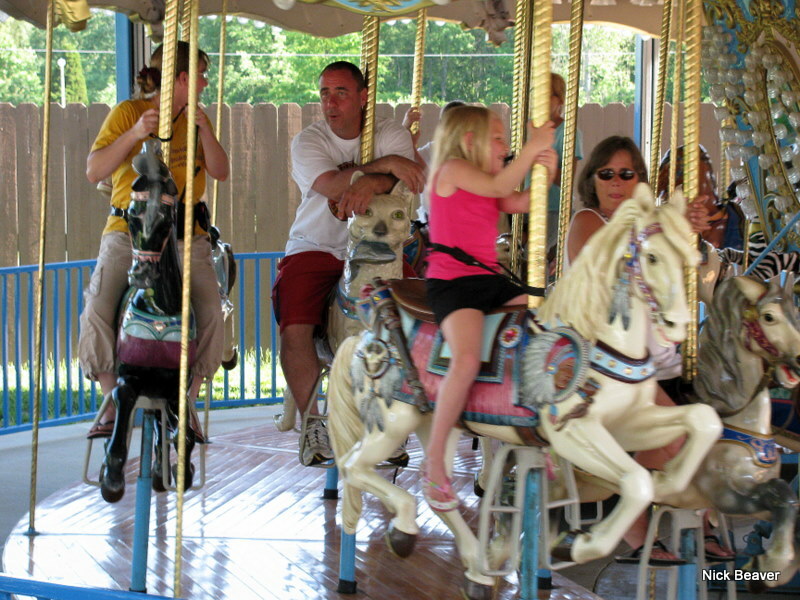 The park seems to lack a "major ride" for families that have kids under 48". The water park is a "must visit" if you are into water rides. Splashin Safari has some of the latest and greatest water ride technology, and plenty of lazy rivers and wave pools to splash around in. Overall, Holiday World is one of the top parks in the country, especially when it comes to "value" and customer service. I visited this park back in September and I absolutely loved it. The Voyage is awesome wooden coaster, despite the roughness. Legend is incredibly underrated in my opinion. Raven was pretty decent too. Another pro of this park is Splashin' Safari, their water park. Splashin' Safari is probably the best water park I have ever been too. Back on HW, the free pepsi was really nice, and their food could have been better, but it was good none the less. Their flat ride line up could use some improvements, but it's still pretty decent. Their water rides also do a good job of getting you soaked. So, if you come within an hour of this park, I suggest you take the time to visit it. 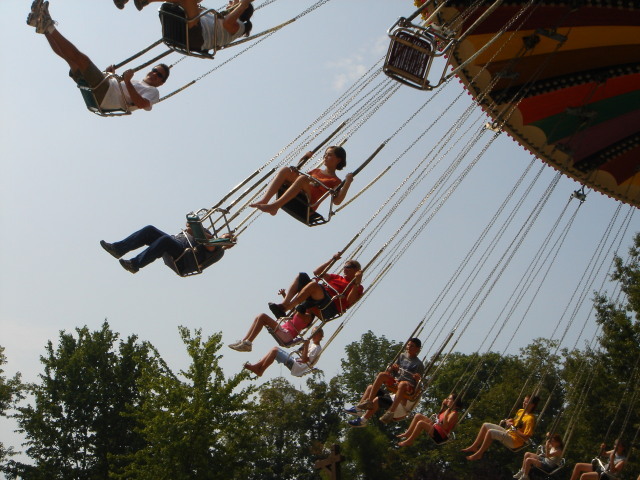 Holiday World takes what you think the amusement park experience is and turns it on its ear. From the moment you enter, with employees enthusiastically greeting you, it has the feel of someplace different. The holiday theming is nicely done, and the park looks great. The food is tremendous, both affordable and delicious. There are just enough rides to have a good assortment, and there is a waterpark that many term is world-class. They have 3 wooden coasters which are the stars, and they are all winners. Raven is quick hitting intensity with good air, Legend is a buffet of laterals, and Voyage is the epic journey into the woods that takes you on a ride you won't soon forget. Air and intensity on levels unlike many others! Go there! Well, that sounds different doesn't it? This park knows how to do things right, especially the little things that make your day that much more easy and enjoyable. All three of the wooden coasters are great each for different reasons. Voyage is just flat out intense, you feel like you have ran a marathon by the time you have hit the break run. The water park is also up there, Wildebeest being one of my favorite water rides I have ridden so far. Hopefully Voyage gets smoothed out one way or another some tim soon though. 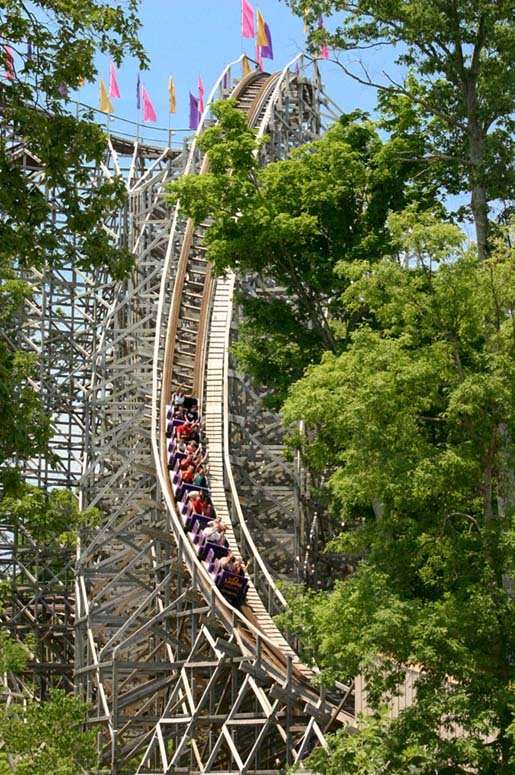 Holiday World is a great family park with some seriously amazing wooden roller coasters. 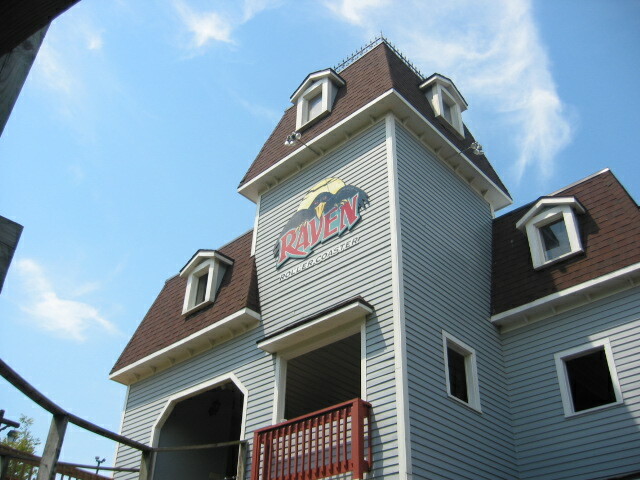 The Raven has been a classic ever since the day it opened, and the Voyage, while not as good recently, is one of the most intense wooden coasters in the world. The park also has a great waterpark that is included with admission that might as well be a Proslide catalog featuring a giant bowl slide, tornado slide, rocket slide, and next year will open a new mammoth rocket slide. Holiday World is a must visit for any coaster enthusiasts, but is also a great place for families. Holiday World prides itself on free parking, free soda, and free sunscreen. All of these are much appreciated, as well as their fantastic wooden coasters. Voyage is a bit rough, but an amazing wooden coaster, and Raven is still a very exciting ride as well. Rides overall are a bit simple, but generally well themed. The waterpark is very well developed, with Wildebeest being the best waterslide ever. I actually avoid waterparks, but Splashin Safari just looked like too much fun for me to pass up. Operations are pretty good all around. Food is priced fairly, and absolutely delicious. There are entertainment offerings, and meeting Santa can be a real treat. Employees (and the town in general) are very friendly. A great place to visit. I went here 5 years ago, while at a summer camp. I had never heard of this place, or knew anything about it. We only went to the water park, but that was enough. I really really liked it. I remember being totally shocked when I found out they had free drinks. I couldn't walk past any of the soda fountains without grabbing a drink just because I could. I also remember my jaw dropping when i found out parking is free. Holiday World is a difficult park to define. I would consider it a major park, but it isn't really a large park like most of them are. 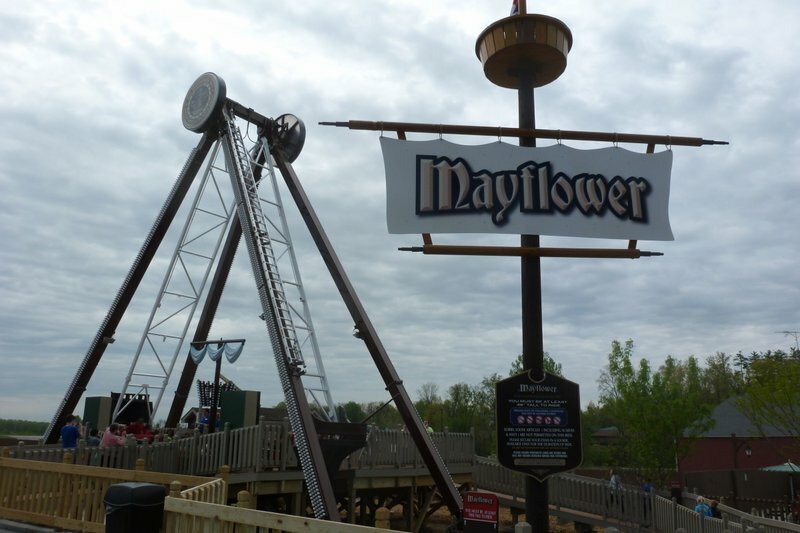 The park has a good selection of non-coaster rides, although they are mostly standard with only a couple exceptions (Pilgrims Plunge and Gobbler Getaway). However, most come here for the three world class wooden coasters. They are a little overrated (especially the Voyage) but they still make up one great trio of rides. The waterpark is also one of the best anywhere, and without it this would be a difficult park to spend a full day at. Not only is the park good, but it is a great value...free parking, free soda, free sunscreen, and $6 gets you a burger, fries, and a cookie. All they need is a steel coaster. This park has one of the best family atmospheres of any park I have ever visited, it is also one of the cleanest parks I have ever seen. Free drinks and no litter to be found amazes me. The roller coasters themselves are awesome and intense. The Raven is the shortest, but it is also the smoothest. 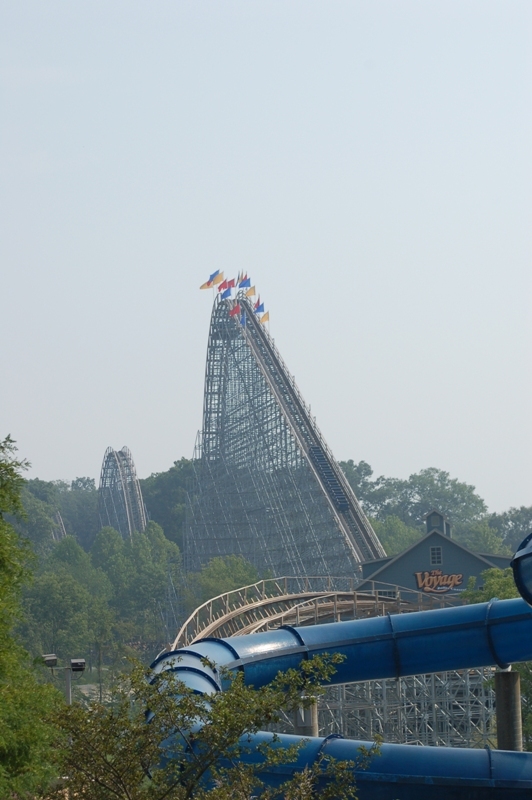 The legend is my favorite with the large amount of laterals, airtime, and huge drops. The Voyage was a monster with it's huge hills and deep and cold underground tunnels. It's a great park, but the water park needs more shade. This is a great small park! The collection of coasters, though small, is very good. There are not a lot of flat rides, but the ones that are there are a lot of fun. Not the most thrilling, but great fun for the family. The water park is a must visit. A really good collection of slides. I felt their operations were very solid, and the food was really good and well priced. Something about the overall presentation of this park just puts a smile on your face. When you leave this park, you will leave happy. Some great people running a great park! 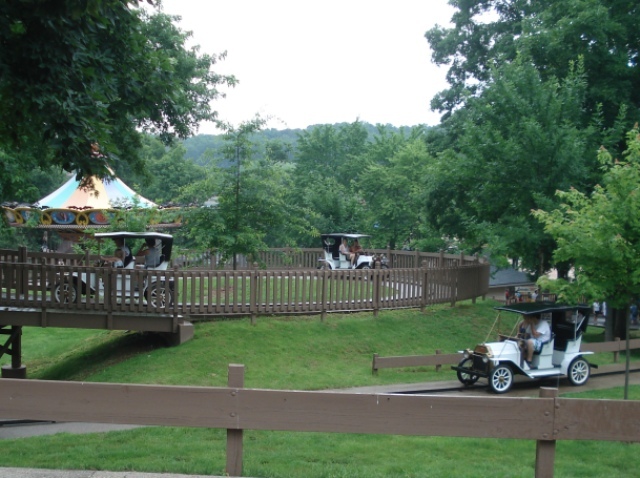 Overpriced Soft Drinks, Loss of Tradition, and lack of scenery are complaints that you'll find at many parks, but Holiday World is one of those parks that tackles these complaints well. The soft drinks are free, the park still feels traditional after all these years, and the theming and landscaping are fantastic. The water park can get crowded, but it is still a lot of fun. The park also has three of the highest rated wooden coasters in the country. My personal favorite is the Raven! 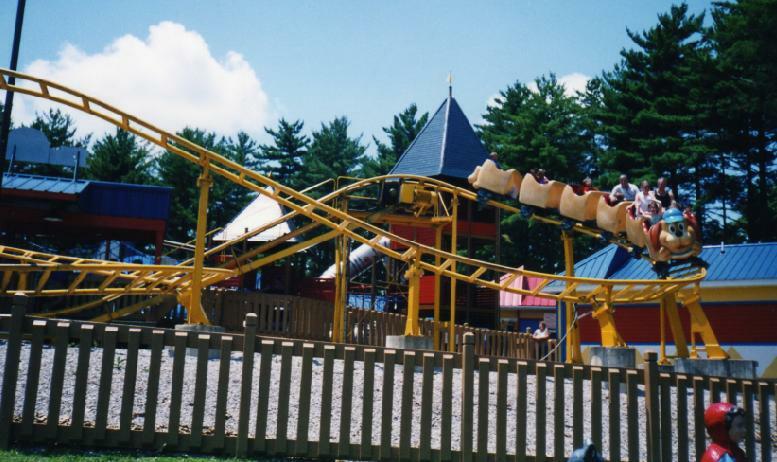 I had heard a lot of hype surrounding Holiday World for a few years. When I got an opportunity to visit, I was extremely pleased to find that not only did this park meet my lofty expectations, but far exceeded them. Every little detail at this park is made with keeping the guest experience at the forefront. Extraordinarily friendly staff, immaculately clean paths/facilities, world class woodies and complimentary drinks/sunscreen set this park apart from others. Holiday World offers three amazing wooden coasters, one of the best 'included' waterparks in the world, and a top notch staff. The employees are polite and always very helpful. Voyage and Wildebeest are world class rides. 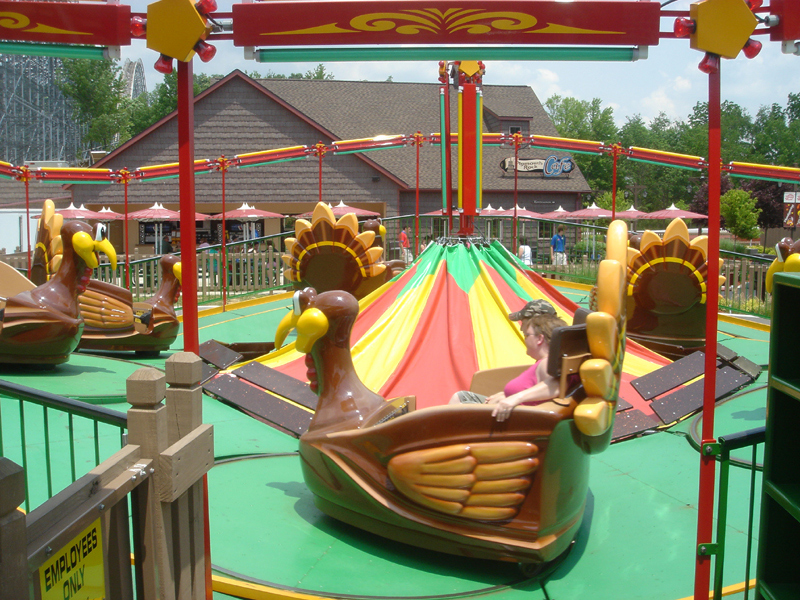 While the flat selection is nothing to write home about, the HallowSwings and Gobbler Getaway offer above average rides. Great atmosphere, super friendly employees, and really clean and well kept. The three woodies are absolutely fantastic with Voyage being truly world class. Well above average water park, and Wildebeest is incredible. Free unlimited soft drinks and sun screen, and food prices are really low compared to most other parks. It's nice to be in a park that's main goal isn't simply to take every cent in your pocket. Dinner at Plymouth Rock Cafe is not to be missed. The park may not seem like a lot on paper. However, you really have to experience it for yourself to be a believer. 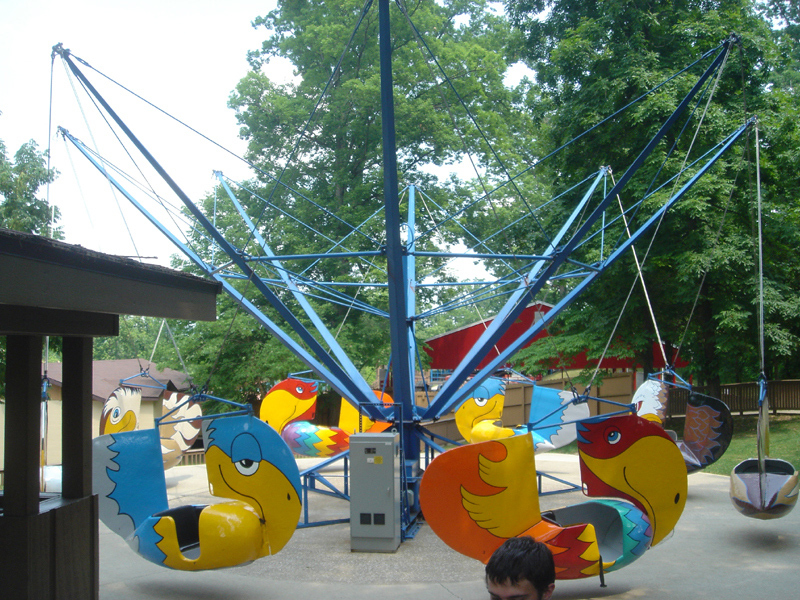 The employees create such a fun-loving atmosphere, the park is clean, and the woodies are awesome! The Voyage is a white-knuckle ride like none other around. The water park is very impressive with great capacity, and free sunscreen. Also, soft drinks are free (and unlimited!) 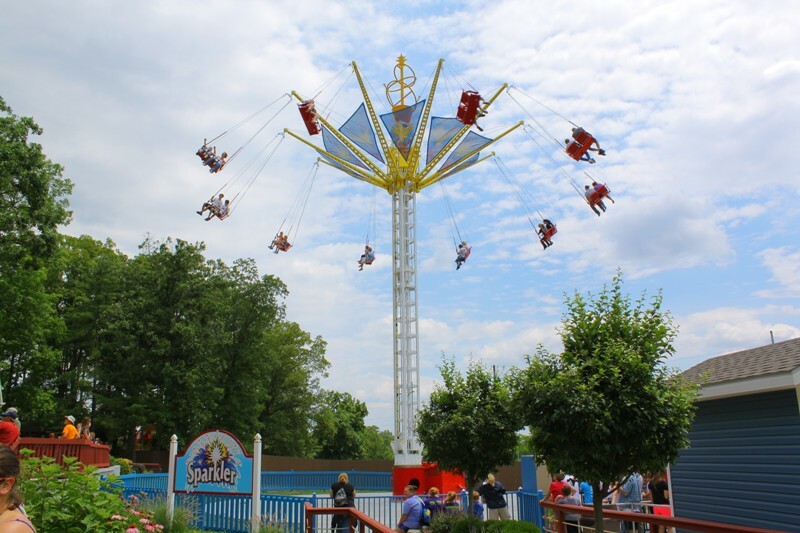 If you are planning a budget-friendly family getaway, Holiday World is your answer! The three woodies are definitely the highlight of the park. The other rides are decent, and the theming is generally ok, but the employees are great, and the water park is very large for being part of the park. The "calling" turkey ride was pretty fun, and Wildebeest was awesome! The food is pretty basic American fair (not only theme park food), and the BBQ was pretty good. Although the theming of Holiday World is a bit "basic," this is a very nice, attractive park with three very intense wooden coasters, a bizarre "turkey-calling" dark ride, and a very good water park. 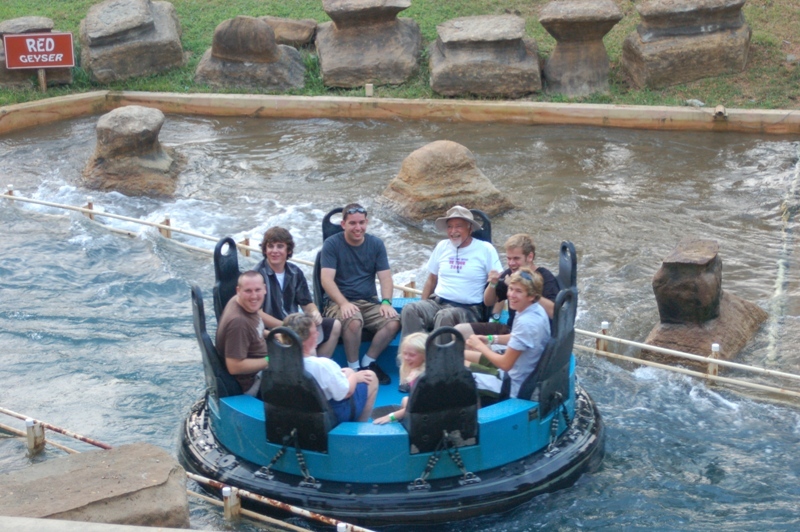 Wildebeest, an LIM-launched water slide, is the best ride there, and Pilgrim's Plunge is fun, too. However, the park's remaining attractions aren't particularly inspiring. If you're into simple, American fare, the food is pretty good, and the drinks are free. The staff is very friendly, too--and they have a great Santa. The wooden coasters here are fantastic. The rest of the park though? Well the collection of flat-rides is very bland, and they're run on fairly tame programs. The food is average (at best) - with the Thanksgiving restaurant probably the least inedible. Staff however, is wonderful, and this really adds to the atmosphere. Aside from the coasters, the park does seem to cater to younger families. The water-park is massive, providing a lot of the fun and variety missing from the dry-park. If you are looking for some quality wooden coasters that are still running great after more than 5 years of being open (*cough* Ghostrider *cough) then this is the park for you. All of these wooden coasters are great rides and each offer something different. The shooting turkey for Thanksgiving ride is pretty fun because where else can you shoot turkeys? The theming in this park is pretty lackluster but with the whole park themed around holidays, that's really not a surprise. Holiday World is another park that has never given me a bad day. The staff is friendly and accommodating (starts at the top with the Koch family), it has three of the best woodies in the world, very reasonably priced food, an excellent water park (included with admission), and a fun holiday theme throughout the park. When you go here, just be ready to have a good time! Admission to water park is included. Free parking, soft drinks, and sunscreen is offered. Most major rides have 48" height restriction. Can get very crowded (especially the water park) on peak season weekends.